Rumors that Apple is considering a future without a physical home button on its iPhones have been bolstered by a patent granted to the company on Tuesday —one that could allow users to authenticate their fingerprint by touching anywhere on the screen. Originally revealed in an application published in July 2016 by the U.S. Patent and Trademark Office, newly granted U.S. Patent No. 9,582,102 describes an "Electronic device including finger biometric sensor carried by a touch display and related methods." While the current implementation of Touch ID works using a dedicated fingerprint reader and capacitive ring built into the home button, the patent suggests that future fingerprint scanning could be done on the display itself. The method used to read fingerprints involves the use of multiple layers to make the screen, including one display layer, at least one transparent conductive layer, and another for fingerprint reading. This biometric sensor could include an interconnect layer with "transparent conductive traces," and a "transparent dielectric layer" between the sensing and interconnect layers. 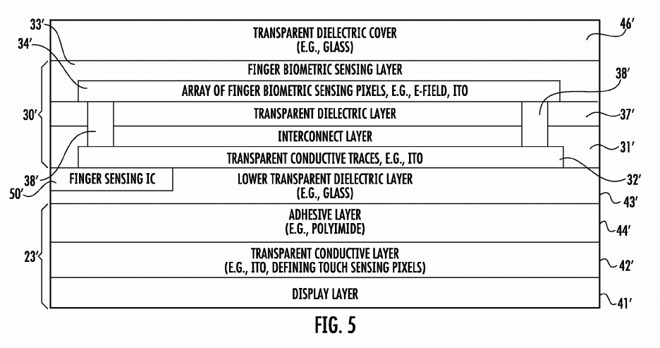 All of these layers would be sandwiched between the display layer at the bottom of the stack and a top "transparent dielectric cover," which the patent suggests could be glass. Though it could be limited to a specific area of the display, it is possible for the sensing area to cover the viewable display area, making the entire screen into a single cohesive fingerprint reader. The patent notes that adding the ability to scan the fingerprint through the display would speed up authentication, performing it automatically during normal use of the device. Time is saved from users having to perform a "separate authentication step," such as moving a finger to the home button for Touch ID to work, making it more convenient compared to existing biometric systems. Apple has been working on making the display a fingerprint reader for a while, and has received multiple patents in the field. Earlier this month, Apple was granted a patent from its LuxVue acquisition for an "interactive display panel with IR diodes," using a combination of infrared light emitters and sensors embedded into the display substrate to read the position of the finger, and to read the user's fingerprint. Another patent published in October for a "Capacitive fingerprint sensor including an electrostatic lens" solves an accuracy issue, with electrostatic lenses preventing a blurring effect of electric fields caused through the separation between the surface the finger touches and the capacitive sensing array. While today's patent does illustrate an iPhone with a home button in one example drawing, it is rumored that Apple may decide not to include a home button at all in the expected "iPhone 8," due this fall. One analyst claims the anniversary iPhone will use a 5.15-inch OLED display in a similar-sized body to iPhones with a 4.7-inch screen, with the larger display necessitating the button's removal. Instead of a physical home button, it is suggested the larger display would have a dedicated "function area" towards the bottom edge, which will offer software-based "system controls." While other biometric systems have been touted for inclusion, such as iris and facial recognition, Apple is likely to keep fingerprint recognition as a primary authentication system, embedding it into the display itself. 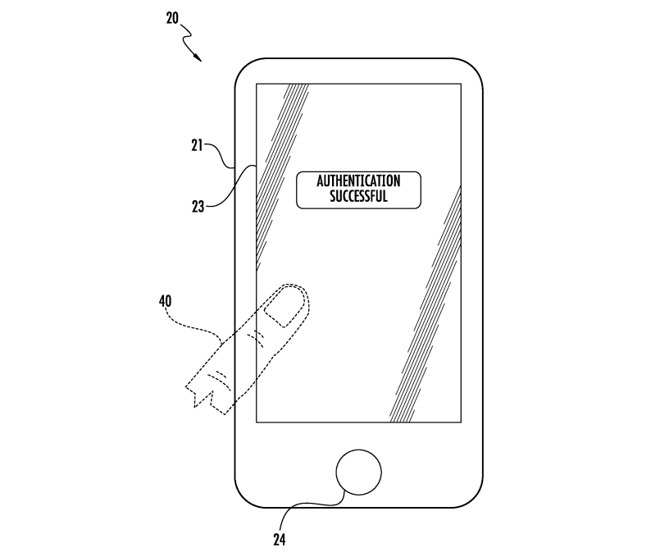 Apple's latest display-based fingerprint reader patent was filed on June 27, 2015, with Dale R. Setlak credited as the inventor. Setlak is the co-founder of AuthenTec, a biometric company Apple acquired in 2012 for $356 million.